Velma Burnley the first female Mayor of Boone passed away on Tuesday at the age of 97. Burnley served as the Mayor from 1989 until 2005. Before that she was a member of the Boone Town Council for two years. 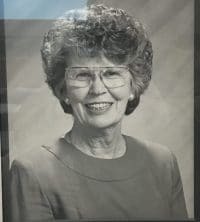 Her other notable contributions to Boone and the county include – Vice President of Northwestern Bank, President of the Boone Area Chamber of Commerce and a founding member of the Watauga County Humane Society. The funeral will be held Monday March 25.